Because, people who travel spend money. Thousands of people travel to and through the town of Cairo for both business and pleasure. With year-round scenic beauty, small-town heart, and good-neighbor values, our town is the perfect place to start a new business or expand your existing enterprise. If your company is seeking a family focused community, with a small-town heart and good-neighbor values, the town of Cairo is the place. If your business is seeking a place to grow in spectacular natural surroundings with access to major thoroughfares, our town is ideal. Running northwest from the intersection of Greene County Rt. 23B and the Bross Street crossing, Cairo's Rt. 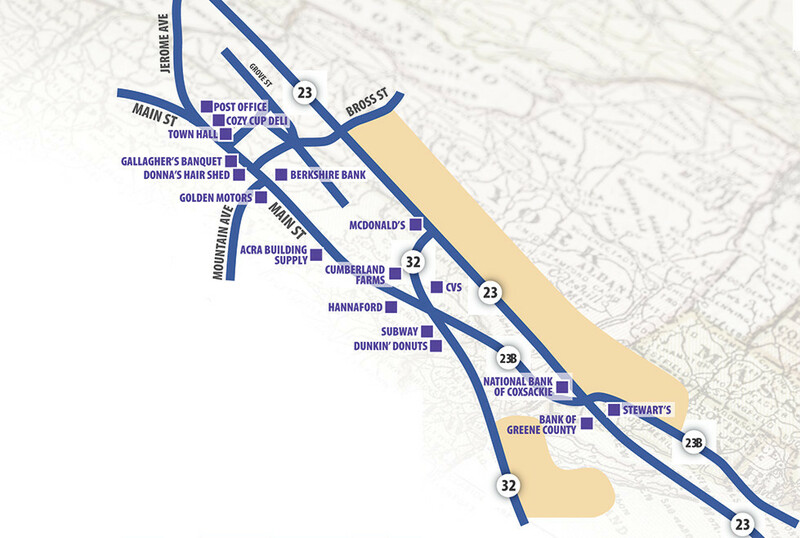 23 Business Corridor is the growth area of our town. 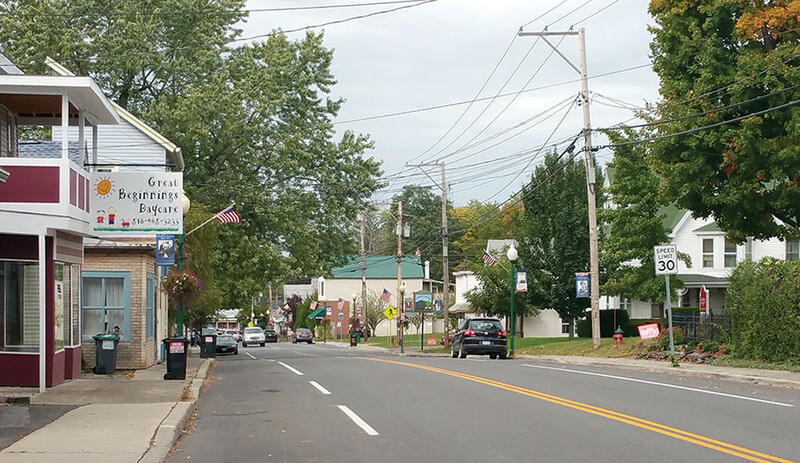 It is anchored by two bank branches, convenience, retail, and professional businesses on the south east, includes the crossroads of NYS Routes 23 & 32 and bisects over 150 acres ready for development. Business and leisure traffic through this corridor make it ideal for Family-Style Restaurants, Retail/Outlet Centers, Light Manufacturing and Distribution Centers, or a Business Complex with associated Hotels and amenities. NYS Rt. 23B becomes Historic Main Street Cairo between Mountain Avenue at the south east and the Jerome Avenue fork at the north west. A true slice of Americana, the heart of our town supports a variety of professional businesses, with ample opportunity for expansion of niche retail shops, B&Bs, specialty food outlets and Cafes. 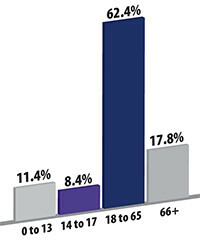 62% of the population of Cairo is between the ages of 18 and 65, with a median age of 42.7 years. The education of residents over 25 years old is 0.4% above the national average with 86.4% earning a High School Diploma or higher and 21.5% holding a Bachelor's Degree or greater. The Great Northern Catskill Mountains form the backdrop for year-round activities in our valley town. The hamlets of Purling, Round Top and Acra offer spectacular hiking, hunting and fishing. Great biking (both on and off road) continues to expand as our town loop and Rail Trail projects move forward. The town maintains a water distribution system that serves the hamlet of Cairo from two wells registered with the New York State Water Authority. The primary well is located within the Town Park and pumps an average of 90,000 gallons per day (GPD) with a capacity of 240,000 GPD. The water district encompasses 380 parcels covering 606 acres. Approximately 300 service connections deliver water to a population of 725. The secondary well serves as an emergency back-up source for continuity of service during a temporary disruption of the main well. Expansion is underway with the testing of new well sites, planning for an additional pressure tank and wider system reach. The Cairo Collection and Treatment system was built in 1999, and serves 286 properties over 317 acres in the hamlet of Cairo. A waste water treatment system designed to process up to 89,000 GPD of grey water from homes and businesses, normally operates at less than 90% capacity, with enough headroom to accommodate periods of high precipitation. The town performs regular maintenance of collection lines and pump stations, displaying a willingness to accommodate expansion through new residential & commercial connections.